This regular column contains information about the latest updates to ArcGIS Online, including new features and capabilities, as well as updates to basemaps and content contributed by the global user community through the Community Maps Program. You can now create interactive filters that allow you to discover and present focused views of your data in a hosted feature layer. You can answer simple questions such as, What is in this dataset? and What information applies to my work? To the person viewing a filtered web map, the filter appears as just another layer in the map. For example, you might create a filter on crime data to show only a specific crime type, such as arson. Your audience can select a different type of crime instead. In addition, you can display an interactive table of the attribute information in a web map, giving you a way to quickly view the data in the feature layer of a map. You can now set layers to display within a range of map scales. Previously, you could set visibility on only certain types of feature layers. You can also now control time settings at the map level. Time settings include a minimum and maximum time extent for the map, a refresh interval for layers, and map display in local time. As the owner of an editable feature service, you can disable editing on the layer in a web map. This is useful if you want the service to be editable but also want to display the feature data in a web map without allowing people viewing the map to edit the data. With your ArcGIS Online subscription, you can publish hosted tiled map services from your tile packages. This allows you to publish your maps on ArcGIS Online without regenerating your tiles if you have already created them on your server. You can also now publish hosted tiled map services from your feature services directly on ArcGIS Online without needing ArcGIS for Desktop. In addition, you can now publish time-enabled feature services on ArcGIS Online. You can use your temporal hosted service to create time-enabled web maps. 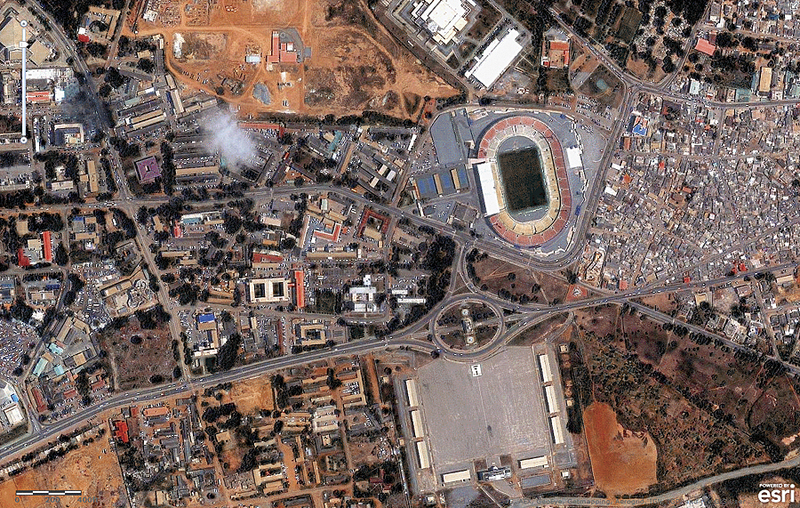 The World Imagery Map now includes 1-meter GeoEye IKONOS imagery for Accra, Ghana, and other parts of Africa. When you register secured ArcGIS for Server token-based services with ArcGIS Online, you now have the option to store authentication credentials along with the service item. This means that ArcGIS Online does not prompt end users for authentication when they access the service, for example, in a web map. ArcGIS Online administrators can now create view-only groups, where only the group owner can contribute content. Members of the group can access items added by the group administrator but cannot share their own content with the group. Administrators can also directly add members to a group, specify a default field for sorting the order of items, and remove items from a group. The template gallery for creating web mapping applications has been updated. A new mobile routing template; a multiviewer template for desktop, tablet, and phone use; a feature viewer template; and a social media template have been added. Templates that have been retired from the gallery are still available as items on ArcGIS Online. You can search ArcGIS Online with the keyword template to find all the available web mapping templates. Administrators of an ArcGIS Online subscription now have the ability to use the organization’s print service for printing web maps with their own map layouts. Content owners can now subscribe to an RSS news feed for comments on an item. This is especially useful if you want to be notified through your favorite RSS reader when somebody has feedback on one of your items. CityEngine users can now create and author 3D city scenes with CityEngine 2012 and publish and share them directly to ArcGIS Online. Using the CityEngine web viewer, anyone can interact with 3D urban landscapes using a web browser. You can navigate the map by zooming, panning, and rotating; change the viewpoint; choose specific layers to view; search for objects and attributes; change sunlight and shadowing; share through various social media; and view additional information about the map. Visit the CityEngine Web Scenes group in ArcGIS Online to explore some examples. To find the group, go to arcgis.com and type in CityEngine Web Scenes in the search box. Make sure your search is set to Search for Groups. The latest release of Esri Maps for Office now supports these nine languages in addition to English: Arabic, Chinese (Simplified Han), French, German, Italian, Japanese, Portuguese (Brazil), Spanish, and Russian. You can download the latest version in the language of your choice. Please note that you need an ArcGIS Online paid or trial subscription to use Esri Maps for Office. A number of enhancements have been made to make it easier for administrators to manage their organization’s ArcGIS Online site. Some of the configuration settings have been reorganized into more focused categories. For example, sharing options are now in the Security section. There is also the ability for administrators to disable comments on items owned by their organizations, and for organizations to register their own print service for their own use. Developers can now add routing and direction capabilities directly to their applications through the Network Analysis Services API. Support for more languages in ArcGIS Online continues to grow. In the December 2012 release, these languages were added, bringing the total number of supported languages to 20: Danish, Hebrew, Lithuanian, and Portuguese (Portugal). The language setting determines the user interface, as well as the way time, date, and numerical values appear. The last set from GeoEye’s IKONOS 50 million-square-kilometer high-resolution imagery has been added to the World Imagery Map. The set includes expanded coverage of 1-meter resolution GeoEye IKONOS imagery for parts of Afghanistan, Africa, Australia, India, New Zealand, and South America. Contributions to the World Imagery Map through the Esri Community Maps Program include several regions in Canada and Switzerland. In December 2012, Esri also started adding DigitalGlobe imagery to the World Imagery Map, with 30-centimeter and 60-centimeter imagery from DigitalGlobe’s Global Basemap layer being added for the United States and western Europe. More DigitalGlobe detailed imagery for the rest of the world will be added in the coming months. Data Appliance for ArcGIS was also recently updated to provide the same maps as ArcGIS Online on a network-attached storage device for organizations that need to access these maps behind their firewall. In addition to updated basemap content, Data Appliance for ArcGIS now also includes the National Geographic World Map and the World Light Gray Base and World Light Gray Reference maps. Get more information. Sign up for a free 30-day trial if your organization doesn’t have an ArcGIS Online subscription yet. You can invite up to five named users to participate in the trial, and you get 200 service credits and Esri Maps for Office as part of your trial. When your trial is over, you can purchase a subscription and continue to use all the features and services with the same ArcGIS Online subscription account. Sign up today.